Distant memory says that the Pier's garish entertainments used to include "Crompton's Cakewalk", where you rolled your penny down a metal launcher onto a moving belt. Then, if your coin was lucky enough to land entirely within the lines, you'd win. Tuppence, perhaps. 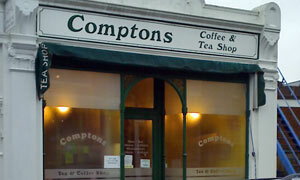 Anyway ... Andy had got it wrong: take out the "r" and you find yourself at Comptons (see map), located centrally on Orwell Road several doors on from the chippy. Not a large establishment, hence not many tables, and all of 'em occupied. Various polite shuffling ensued before we could take a pew. Lots of savoury choice on the properly spelled menu. Jacket spud with chicken curry for me: need summat warming on another grotty Friday. If you judge a place by its side salad, theirs featured an orange slice plus a chunk of melon. As you do. Andy's soup demonstrated that sometimes the tide goes out. Anxious to finish firsts so we could start seconds. Board listed Dawn's Desserts in a typeface worthy of a Specsavers test. Does that say waffles with vanilla ice cream and toffee sauce? That's what turned up after five mins, even though Andy had ordered the bread & butter pudding. Needless to say, they were happy to put this right. B&B pudd came covered in custard. Inside, the waitresses can be seen through the serving hatch in a walled off area which, bizarrely, includes a tiled roof. Original design feature, I guess. Outside, the larger lettering reads Coffee & Tea Shop, whereas the stencilled windows read Tea & Coffee Shop. My own coffee wasn't memorable; carrot cake was just about worthy of a quickly scrawled postcard home. If it was a car -- Humber Sceptre. If they were passing by -- Phyllida Law.